Hello Everyone. Prinoftherng here coming to you with another archetype. It's been a LONG,LONG....TIME since I've been on here and I just wanna give you guys a treat. Today's archetype is one that I literally made and completed within 12 hours. 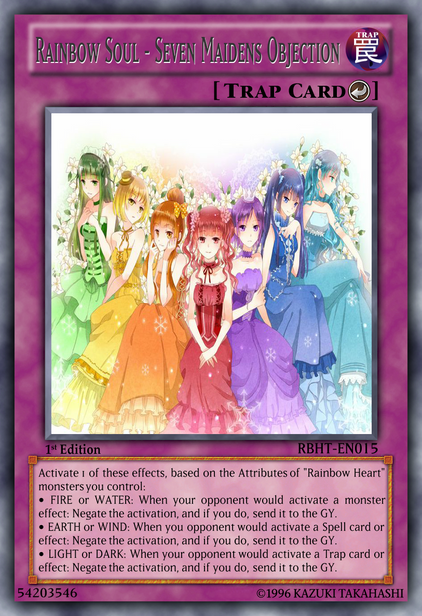 The Rainbow Hearts archetype. I'll give you a little story on them. • STORY TIME: Based on the colors of the rainbow, the world was separated into 7 sections (like 7 continents) by the almighty Colorless, the goddess of the rainbow world.. Each Section was based on the colors of the rainbow: ROYGBIV (white is also part of the archetype but that can go anywhere. LOL). Anyway. Each section represents an archetype and/or type. They also have one exclusive season to them depending on their region. the FIRE and WIND sections have exclusively Spring, the LIGHT and WATER sections have summer, the EARTH and DARK sections have Autumn, and winter.....well, winter is a surprise punishment to those sections that cause trouble among other sections of the world. These winters are brutal and can be highly lethal. • ARCHETYPE DETAILS: This archetype is based on bring out the "Rainbow Soul" Spell and Traps to help support the monsters. They also have a field spell that gains the monster an extra effect. Their attributes matter as they give off effects by the Spell and Traps. They also have Link Monsters that are based off of seasons and also give all support for their respective attributes (oh yeah, some rainbow heart monsters have more than 1 attribute). By uniting the 7 rainbow hearts, the almighty Colorless comes and brings divine being onto the field. Basically.....look at the archetype and cards themselves to get an idea from them. BTW, there names are based off the color names of different languages. If this card is Summoned: You can add 1 "Rainbow Heart" mosnter from your Deck to your hand. You can only use this effect once per turn. While you control a "Rainbow Soul" Field Spell in your Field Zone, this card gains this effect. • Once per turn: You can target 1 other "Rainbow Heart" monster you control and 1 monster your opponent controls; destroy them. If both cards weren't desotryed by this effect: You can draw 1 card. If this card is Summoned: You can add 1 "Rainbow Soul" Spell or Trap from your Deck to your hand. You can only use this effect once per turn. While face-up on the field, in your GY, or banished, this card is also LIGHT-Attribute. While you control a "Rainbow Soul" Field Spell in your Field Zone, this card gains this effect. • Once per turn: You can target 1 other "Rainbow Heart" monster you control and 1 card in your opponent's Spell and Trap Zone; destroy those targets. If both cards weren't destroyed by this effect: You can draw 1 card. 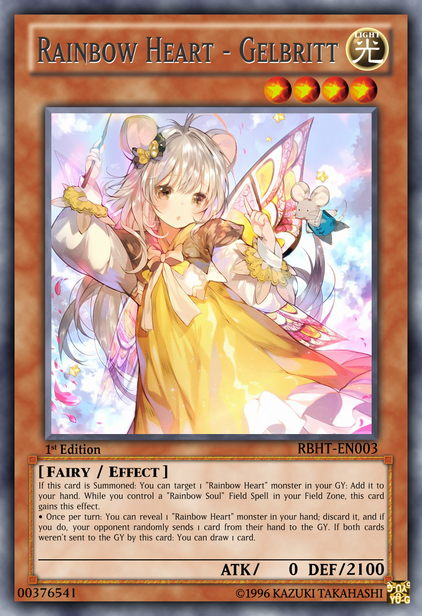 If this card is Summoned: You can target 1 "Rainbow Heart" monster in your GY: Add it to your hand. While you control a "Rainbow Soul" Field Spell in your Field Zone, this card gains this effect. • Once per turn: You can reveal 1 "Rainbow Heart" monster in your hand; discard it, and if you do, your opponent randomly sends 1 card from their hand to the GY. If both cards weren't sent to the GY by this card: You can draw 1 card. If this card is Summoned: You can target 1 "Rainbow Soul" Spell or Trap in your GY; add it to your hand. You can only use this effect once per turn. While you control a "Rainbow Soul" Field Spell in your Field Zone, this card gains this effect. • Once per turn: You can target 1 "Rainbow Heart" or "Rainbow Soul" card in your GY and 1 card in your opponent's GY; banish those targets. If both cards weren't banished by this effect: You can draw 1 card. 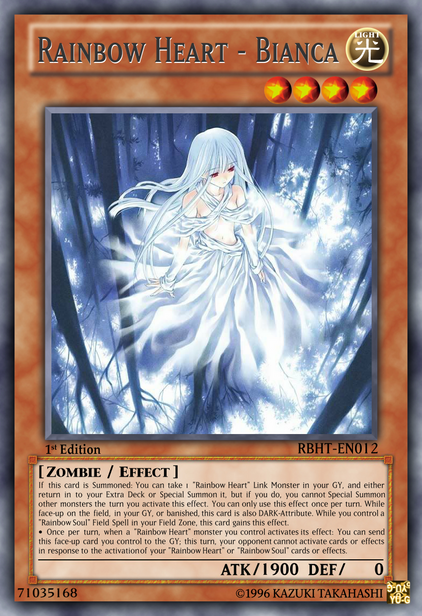 If this card is Summoned: You can send 1 "Rainbow Heart" monster from your Deck to the GY. You can only use each effect once per turn. While you control a "Rainbow Soul" Field Spell in your Field Zone, this card gains this effect. • Once per turn: You can target 1 other "Rainbow Heart" monster you control and 1 monster your opponent controls; until the End Phase, halve your opponent's monsters ATK, and if you do, your monster gains that lost ATK. If either monster leaves the field or becomes unaffected by this effect before it resolves: You can draw 1 card. 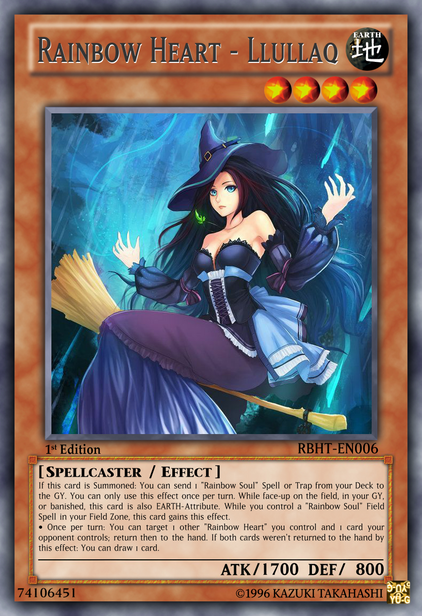 If this card is Summoned: You can send 1 "Rainbow Soul" Spell or Trap from your Deck to the GY. You can only use this effect once per turn. While face-up on the field, in your GY, or banished, this card is also EARTH-Attribute. While you control a "Rainbow Soul" Field Spell in your Field Zone, this card gains this effect. • Once per turn: You can target 1 other "Rainbow Heart" you control and 1 card your opponent controls; return then to the hand. If both cards weren't returned to the hand by this effect: You can draw 1 card. If this card is Summoned: You can target 3 "Rainbow Heart" or "Rainbow Soul" cards in your GY; Shuffle them into your Deck, and if you do, draw 1 card. You can only use this effect once per turn. While you control a "Rainbow Soul" Field Spell in your Field Zone, this card gains this effect. • Once per turn: You can banish 1 "Rainbow Heart" or "Rainbow Soul" from your Deck and 1 card from your opponent's Deck face-down (your opponent does not look at the card). During your 3rd Standby Phase after this effect's activation: Add those cards to their owner's hand. If both card are not added to the hand by this effect: You can draw 1 card. If this card is Summoned: You can take 1 "Rainbow Heart" Link Monster in your GY, and either return in to your Extra Deck or Special Summon it, but if you do, you cannot Special Summon other monsters the turn you activate this effect. You can only use this effect once per turn. While face-up on the field, in your GY, or banished, this card is also DARK-Attribute. While you control a "Rainbow Soul" Field Spell in your Field Zone, this card gains this effect. • Once per turn, when a "Rainbow Heart" monster you control activates its effect: You can send this face-up card you control to the GY; this turn, your opponent cannot activate cards or effects in response to the activation of your "Rainbow Heart" or "Rainbow Soul" cards or effects. Cannot be Normal Summoned/Set. Must be Special Summoned (from your hand) by banishing 7 "Rainbow Heart" monsters with different names and Attributes from your field or GY. This card's Special Summon cannot be negated. When Special Summoned, cards and effects cannot be activated. 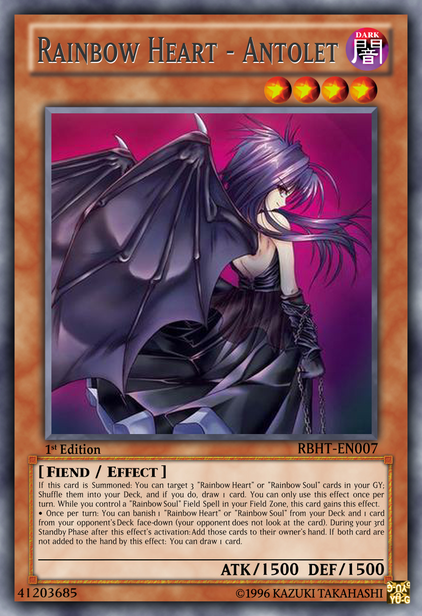 While face-up on the field, this card gains the Attributes of your banished "Rainbow Heart" monsters. Cannot be tributed. Unaffected by effects of monsters whose Attribute is the same as this card. You cannot activate the following effect the turn it is Special Summoned. (Quick Effect): You can tribute this Special Summoned card, then target as many of your banished "Rainbow Heart" monsters as possible; Special Summon them, and if you do, gain LP equal to the total ATK of the monsters summoned by this effect. You can only use this effect once per turn. When this card is activated: You can activate 1 "Rainbow Soul" Spell or Trap from your hand or GY. You can only use this effect once per turn. 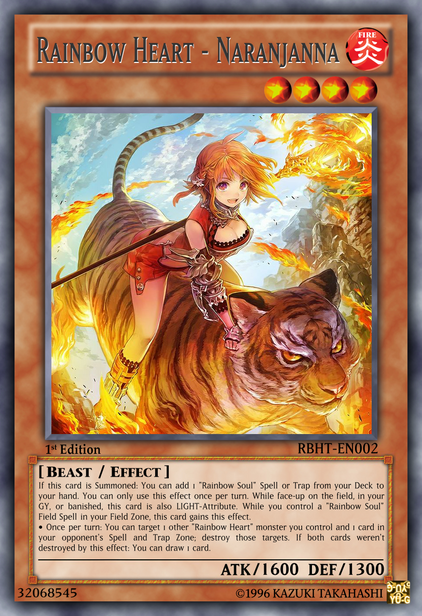 This card gains these effects, based on the different Attributes of "Rainbow Heart" monsters you control: • FIRE: This card cannot be targeted or destroyed by card effects. • WATER: Your opponent cannot activate Field Spells while this card is on the field. • EARTH: "Rainbow Soul" cards in your Spell and Trap Zone cannot be targeted by your opponent's card effects. • WIND: "Rainbow Soul" cards cannot be destroyed by card effects. • LIGHT: All "Rainbow Heart" monsters you control gain 500 ATK. • DARK: All monsters your opponent controls lose 500 ATK. When this card is activated: You can add 1 FIRE or WIND "Rainbow Heart" monster from your Deck to your hand. If this card is destroyed: You add 1 "Rainbow Soul" Continuous Spell from your Deck to your hand, except "Rainbow Soul - Quieting Spring". You can only use each effect once per turn. 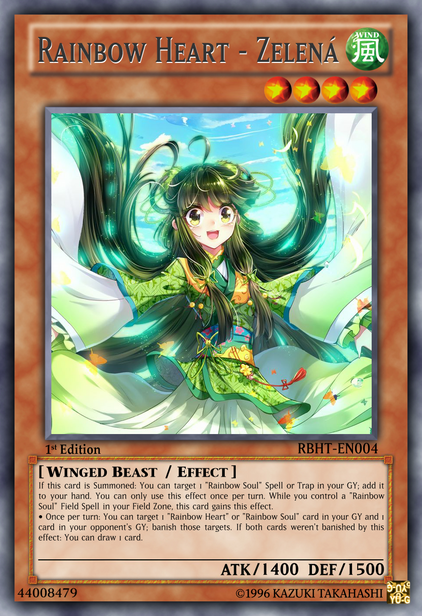 While this card is on the field, you can activate the effects of FIRE and WIND "Rainbow Heart" monsters you control during either player's turn. 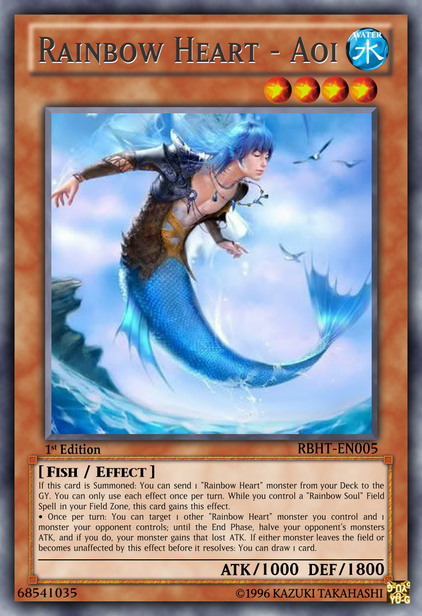 When this card is activated: You can add 1 LIGHT or WATER "Rainbow Heart" monster from your Deck to your hand. 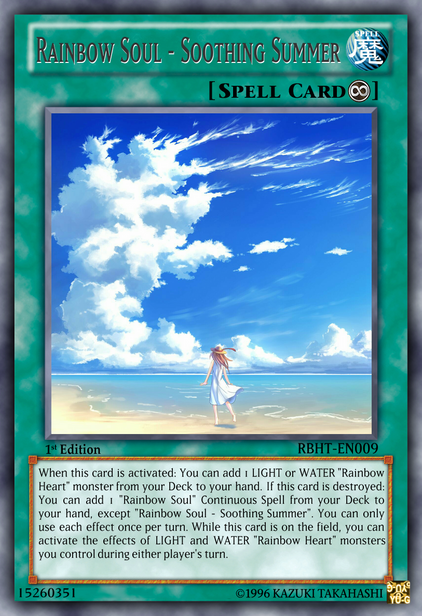 If this card is destroyed: You can add 1 "Rainbow Soul" Continuous Spell from your Deck to your hand, except "Rainbow Soul - Soothing Summer". You can only use each effect once per turn. 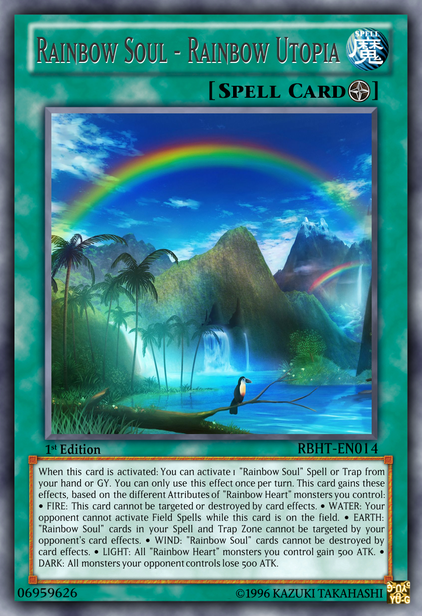 While this card is on the field, you can activate the effects of LIGHT and WATER "Rainbow Heart" monsters you control during either player's turn. When this card is activated: You can add 1 EARTH or DARK "Rainbow Heart" monster from your Deck to your hand. If this card is destroyed: You can add 1 "Rainbow Soul" Continuous Spell from your Deck to your hand, except "Rainbow Soul - Chilling Autumn". You can only use each effect once per turn. While this card is in your Spell and Trap Zone, you can activate the effects of EARTH and DARK "Rainbow Heart" monsters you control during either player's turn. 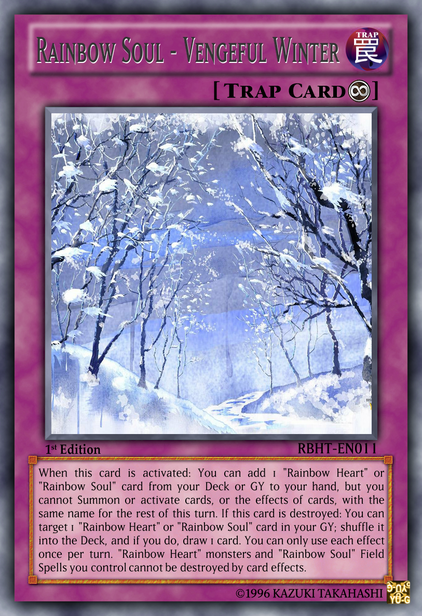 When this card is activated: You can add 1 "Rainbow Heart" or "Rainbow Soul" card from your Deck or GY to your hand, but you cannot Summon or activate cards, or the effects of cards, with the same name for the rest of this turn. 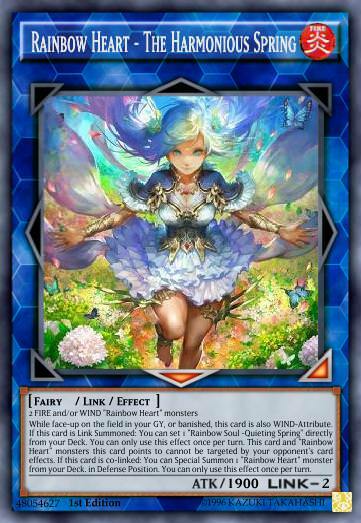 If this card is destroyed: You can target 1 "Rainbow Heart" or "Rainbow Soul" card in your GY; shuffle it into the Deck, and if you do, draw 1 card. You can only use each effect once per turn. "Rainbow Heart" monsters and "Rainbow Soul" Field Spells you control cannot be destroyed by card effects. • FIRE or WATER: When your opponent would activate a monster effect: Negate the activation, and if you do, send it to the GY. • EARTH or WIND: When you opponent would activate a Spell card or effect: Negate the activation, and if you do, send it to the GY. • LIGHT or DARK: When your opponent would activate a Trap card or effect: Negate the activation, and if you do, send it to the GY. While face-up on the field in your GY, or banished, this card is also WIND-Attribute. 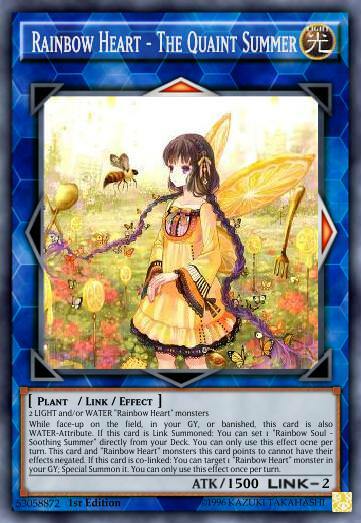 If this card is Link Summoned: You can set 1 "Rainbow Soul -Quieting Spring" directly from your Deck. You can only use this effect once per turn. This card and "Rainbow Heart" monsters this card points to cannot be targeted by your opponent's card effects. 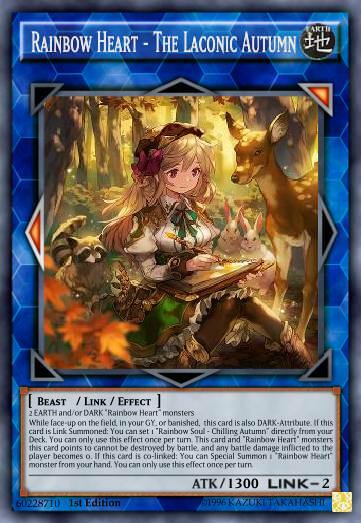 If this card is co-linked: You can Special Summon 1 "Rainbow Heart" monster from your Deck. in Defense Position. You can only use this effect once per turn. While face-up on the field, in your GY, or banished, this card is also WATER-Attribute. 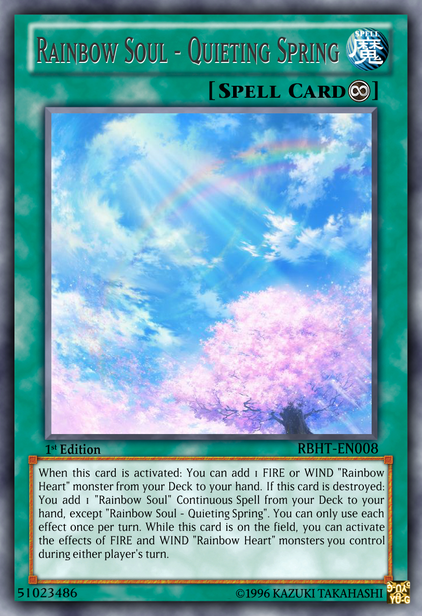 If this card is Link Summoned: You can set 1 "Rainbow Soul - Soothing Summer" directly from your Deck. You can only use this effect ocne per turn. 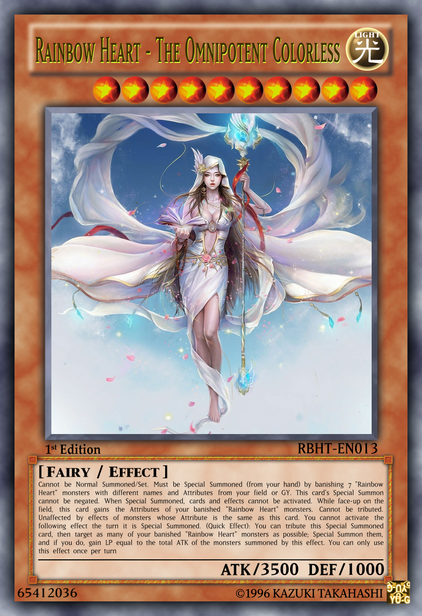 This card and "Rainbow Heart" monsters this card points to cannot have their effects negated. If this card is co-linked: You can target 1 "Rainbow Heart" monster in your GY; Special Summon it. You can only use this effect once per turn. While face-up on the field, in your GY, or banished, this card is also DARK-Attribute. 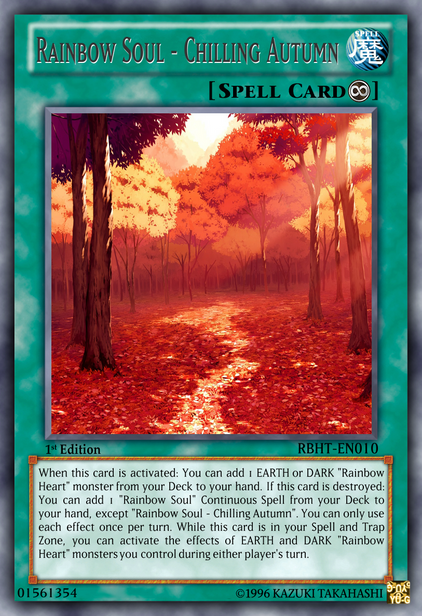 If this card is Link Summoned: You can set 1 "Rainbow Soul - Chilling Autumn" directly from your Deck. You can only use this effect once per turn. 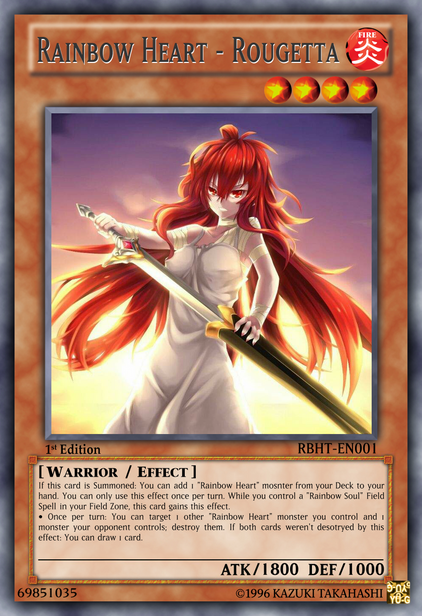 This card and "Rainbow Heart" monsters this card points to cannot be destroyed by battle, and any battle damage inflicted to the player becomes 0. If this card is co-linked: You can Special Summon 1 "Rainbow Heart" monster from your hand. You can only use this effect once per turn. While face-up on the field, this card's gains different Attributes among the Attributes of the monsters used for this card's Link Summon. 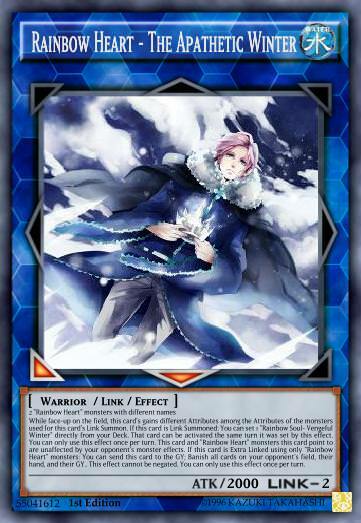 If this card is Link Summoned: You can set 1 "Rainbow Soul- Vengeful Winter" directly from your Deck. That card can be activated the same turn it was set by this effect. You can only use this effect once per turn. This card and "Rainbow Heart" monsters this card point to are unaffected by your opponent's monster effects. If this card is Extra Linked using only "Rainbow Heart" monsters: You can send this card to the GY; Banish all cards on your opponent's field, their hand, and their GY.. This effect cannot be negated. You can only use this effect once per turn. AND.....That's all for this archetype. Like I said, it's been a while since being on this site and it's my first archetype in a while. If you see any OCG errors, please tell me and i'll try to correct it as soon as I can. I am only human after all. Anyway....that's it. Comment, Like, CnC, whatever. Ok Guys.....LATER!!!! !